Carlos Camarena needs no introduction to those familiar with fine Tequila, but for those of you who are still getting your feet wet: he's the man behind a number of outstanding brands on today's market; those baring the NOM number 1474 on the side label. His father first founded La Alteña in 1937 and, like any great winemaker, he's always been much more interested in the agricultural side of production rather than the distillation and began his career in the fields. We went down to his distillery in Arandas this past Fall to spend some time in the Highland fields with him, learning the intricate details of agave reproduction and the delicate ecosystem that supports their growth. Seeing that his world famous distillery was celebrating its 80th anniversary, Carlos was allowing select retailers to choose a limited number of single Reposado barrels to have privately bottled. Needless to say, it was an invitation we weren't going to pass up. 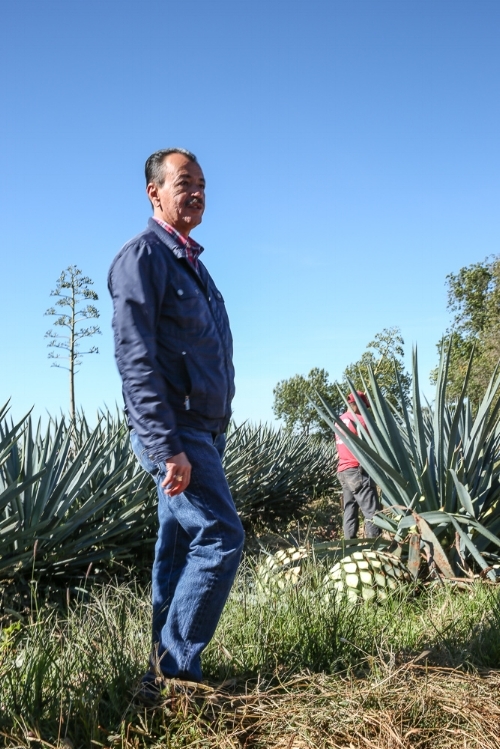 Like most wine enthusiasts shun the excessive extraction or manipulation of top quality fruit, serious Tequila drinkers want to know exactly what's being done with their Highland agave after it's harvested. With all of the tricks, shortcuts, and hijinks happening behind the scenes of our modern alcoholic world, it's tough to know for sure if anything is still real these days. Rest assured, however, that the production at La Alteña is pretty straightforward. The agave comes in from the field, it gets chopped up by these guys, and then it goes on a conveyor belt into the oven. There are two guys who collect the piñas and stack them in the oven for the steaming process, which cleans the bitter and somewhat waxy residue off the agave, while cooking and concentrated the sugars inside. Every Tequila made at La Alteña starts this way. I've always found that Tequila has much more in common with wine than whiskey, and in visiting the various agave distilleries of Mexico that comparison holds true on the production side as well. Some distilleries are like sterile custom crush pads with nothing more than the proper equipment and truck loads of material being dropped off for preparation. Others are actual estates, surrounded by their own vineyards (or agave fields, in this case), with an atmosphere and an aura all their own. La Alteña is definitely the latter. It's like the Ridge or Stag's Leap of Jalisco, a heralded property that has continued to make quality liquid despite its growth and enhancements over the years. Any great wine's reputation will (and should) always begin with the quality and the location of its vineyards. In the case of La Alteña, the agave is planted in the vibrant red soils of the Jalisco Highlands, which create a much different flavor profile than those planted in the Lowlands. Whereas Lowland agave produces a greener, more vegetal and herbaceous style of Tequila, Highland agave piñas tend to be larger, fruitier, and sweeter in flavor due to the difference in both soil types and climate. I've heard people compare Highland Tequilas to Highland single malts, but I've never liked that analogy. The classic Highland single malt profile has much more to do with stylistic choice than terroir. The difference between Highland and Lowland Tequila is more like the different between Napa mountain and valley-grown Cabernet. Due to the recent shortage of agave, many large producers (especially those using diffusers) don't distinguish between the geographical origins of their piñas, but that's no different than buying a bottle of red wine that says "California" on the label and one that very specifically indicates "Howell Mountain." When you buy a bottle of El Tesoro, you know you're getting Tequila made from Camarena family estate Highland agave. Our three single casks have just arrived, showcasing both the high quality of Carlos Camarena's Tequila and the unique characteristics that single barrel bottling provides. I hope you enjoy them as much as we do!